Gaius Julius Solinus, a grammarian and compiler, wrote this work probably in the early 3rd century AD. It is a compilation of curiosities, derived from earlier writers such as Pliny the Elder, covering the ancient world, historical, social, religious and natural history. 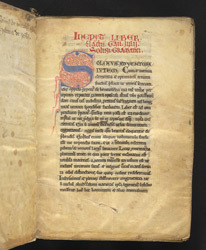 This manuscript was owned in the Middle Ages by Reading Abbey in Berkshire, a large number of whose manuscripts survive in the British Library and elsewhere.